The name Ma Jong conjures up many different images; a traditional Asian card game, the matriarch to a centuries old family name. This multi-cultural concept was designed with those things in mind. Blended authentic Asian food destined to please the most discriminating purveyors of Asian cuisine. The blended aromas of wok prepared meats, fish, and fresh vegetables will lure you over and over again. Ma Jong's will feature flavors from Japan, Korea, Thailand, Vietnam, and China. The recipes on the menu are inspired by the Asian Grandmothers of each of these cultures. The contemporary version of this Asian fare is prepared with only the finest and freshest ingredients and will take you through and exploration of new and traditional flavors. The menu features daily specials and signature dishes that will tempt any palate. Americans have begun to appreciate Asian flavors in recent years and there is no doubt Asian food is here to stay. From soy, wasabi, basil, and peanut sauce, Ma Jong's covers the map with flavors both authentic and delightful. With 3,000 square feet, Ma Jong's can seat 75 guests comfortably with an additional 60 in the dramatic outdoor patio. Natural wood countertops and low back seating complete the village atmosphere and include a 400-year-old Buddha. This innovative concept and unique setting promise to deliver to a wide variety of guests. 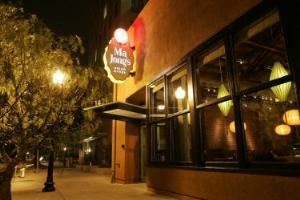 Families, working professionals, and business travelers will frequent Ma Jong's time and time again due to the variety of flavorful dishes, the humble and gracious staff, and the uniquely crafted atmosphere. We Accept Limited Private Events at Ma Jong's Asian Diner. Please contact our managers at *NOT DISPLAYED* to inquire about availabilities. We Accept Limited Private Events at Ma Jong's Asian Diner. Please contact our managers at 916.442.7555 to inquire about availabilities. Special Features: Natural wood countertops and low back seating complete the village atmosphere and include a 400-year-old Buddha. The contemporary version of Asian fare is prepared with only the finest and freshest ingredients.